As discussed in more detail in hidden meaning of Chinese charm symbols and open work charms, the fish is one of the oldest of the traditional animal symbols in China. Because the Chinese character for fish (yu 鱼) is pronounced the same as the Chinese character for surplus (yu 余), the fish symbol is frequently used to symbolize the wish for more in the sense of good luck, good fortune, long life, children, etc. And, the Chinese particularly like to fashion charms using the carp fish as the model because the Chinese character for carp (li 鲤) is pronounced the same as the character (li 利) for "profit". One of the most frequently seen images in Chinese art is that of a carp swimming and leaping against the current of a river to reach the spawning grounds. The images illustrate the legend (liyutiaolongmen 鲤鱼跳龙门) that a carp which is able to leap over the mythical "Dragon Gate" will become a dragon. The Chinese understand this to be an allegory for the persistent effort needed to overcome obstacles. The Chinese believe that a person must pass through a number of gates, barriers and crises during the course of one's life. These barriers or gates are called guan (关) in Chinese. A child by the age of 15 is supposed to have passed through 30 of these dangerous gates. These life barriers have names such as the "Barrier of the Demon of the Four Seasons", "Barrier of the Devil's Gate", and "Barrier where the Bowels are Severed" among others. During ancient times, medical care was primitive and the mortality rate for Chinese children was very high. Chinese parents therefore relied on charms and rituals to help protect their children as they faced these difficult passages and crises in growing up. 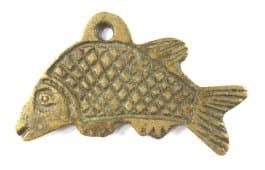 The old charm shown here is in the shape of a carp fish because it is meant to symbolize persistence and effort in crossing life's barriers or gates as a child grows to maturity. The inscription is read right to left as guan sha xiao chu (官煞消除). Just as the Chinese like to use animals and objects to symbolize other things with the same pronunciation (see hidden meaning), in this inscription the first character guan (官), which means an official, should actually be written as guan (关) which means a gate or barrier. Guan sha (关煞) refers to the "crises in a child's life" and xiao chu (消 除) means "to dispel or eliminate". For the Chinese language purists, the character chu (除) in the inscription is also written incorrectly with the radical " 亻". 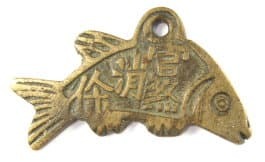 The charm in the shape of a carp fish with this inscription thus symbolizes perseverance in overcoming the barriers and gates a child must pass through to reach adulthood. The reverse side of the charm has no inscription. The prominent scales indicate that the fish is a carp. This charm has a maximum length of 59 mm and maximum width of 31 mm. The charm weighs 16.8 grams. For other charms used by Chinese parents to protect their children please see Chinese Lock Charms. To see an ancient Chinese coin with a fish depicted on its reverse side cast in 214 AD during the Three Kingdoms period, please visit Chinese Coins with Charm Features.